Yale University Press, 9780300176483, 304pp. 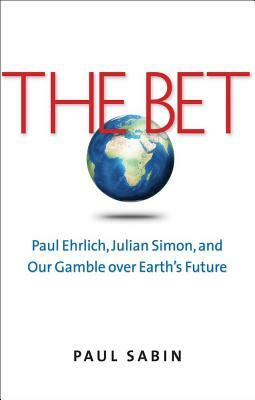 In 1980, the iconoclastic economist Julian Simon challenged celebrity biologist Paul Ehrlich to a bet. Their wager on the future prices of five metals captured the public's imagination as a test of coming prosperity or doom. Ehrlich, author of the landmark book The Population Bomb, predicted that rising populations would cause overconsumption, resource scarcity, and famine with apocalyptic consequences for humanity. Simon optimistically countered that human welfare would flourish thanks to flexible markets, technological change, and our collective ingenuity.Simon and Ehrlich's debate reflected a deepening national conflict over the future of the planet. The Bet weaves the two men's lives and ideas together with the era's partisan political clashes over the environment and the role of government. In a lively narrative leading from the dawning environmentalism of the 1960s through the pivotal presidential contest between Jimmy Carter and Ronald Reagan and on into the 1990s, Paul Sabin shows how the fight between Ehrlich and Simon between environmental fears and free-market confidence helped create the gulf separating environmentalists and their critics today. Drawing insights from both sides, Sabin argues for using social values, rather than economic or biological absolutes, to guide society's crucial choices relating to climate change, the planet's health, and our own. Paul Sabin is associate professor, Department of History, Yale University. He was founding director of the Environmental Leadership Program and is the author of Crude Politics: The California Oil Market, 19001940."